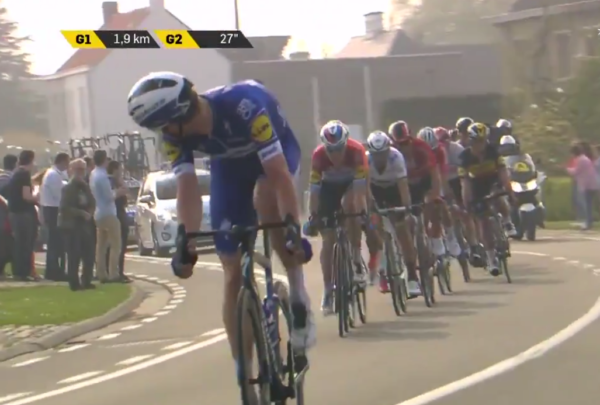 This move – you couldn’t call it an attack – saw Kasper Asgreen get off the front and ride to 2nd place at the Tour of Flanders. And you can definitely do this in any amateur race in Ireland. Here’s a racing move we want you to have a very close look at. This can be used to get race results in any kind of racing you’re doing; from A1 to A4. With 2km remaining in the Tour of Flanders yesterday Alberto Bettiol (EF Education First) was already clear alone and headed for victory. But in the large chasing group behind him the racing was on for the final places on the podium. Kasper Asgreen (Deceuninck-Quick Step) and his team mate Bob Jungels combined brilliantly to net 2nd place for Asgreen. The 24-year-old Dane was on the front, with Jungels right behind him in the line. Jungels simply let the gap between his front wheel and his team mate’s rear wheel open a little. And when Asgreen realised he had even a tiny gap, he went for it. In the end he took 2nd place some 14 seconds behind the winner. And he was three seconds ahead of the 15 other men going for 3rd place; an excellent result for the young rider. The key thing here is how Jungels let the gap open and how Asgreen responded. Jungels only eased back on his pace ever so slightly; continuing to pedal, just doing it more gently. If he had freewheeled or slowed right down, it would have alerted those immediately behind him that Asgreen was pedaling away. As a result, those behind would have darted around Jungels and closed the gap to Kasper Asgreen. Instead, Jungels was really subtle, just about letting a gap open. And when Kasper Asgreen saw this, he went for it. You can see Jungels in the clip getting onto the race radio; we assume relaying the message to the team car so they would immediately tell Asgreen to go for it. If you and your team/club mate are trying this in a race, you won’t have the luxury of race radio. But if you pick a section of course (planning it pre-race) and make sure you are first and second in line at that point, you can try it. The second rider should just about let the gap open; don’t hit the brakes or slow right down. And as the second rider slows a little, the first rider needs to really commit and a gap should open. Once a gap opens, somebody in the group behind has to decide to chase and then commit to chasing. And if they don’t, the rider off the front may be able to ride away to a win or a placing. You can do this move in any race. But narrow roads or heading into a chicane or a twisty section are best; giving the first rider the best chance to bury themselves before the others in the group even realise they are off the front.